So I have some clippings from my boss and she doesn't know what it is! 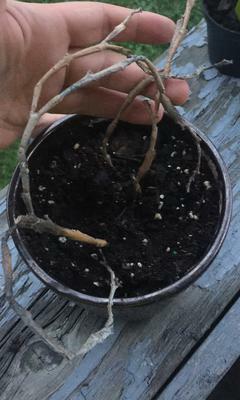 It's a succulent but it looks like a dead weeping willow. It never produces any leaves only teeny tiny yellow flowers that you have to look very closely at to see. The picture I am posting is of my clippings. My bosses plant is about 2 feet and all droop over when they get to the top. It's pretty much impossible to identify a plant from just a dead looking stick. Sorry. If it roots and grows some leaves, that would be a good time to post more pics. The only kinds of plants I can think of that grow tiny yellow flowers are Hatiora salicornioides, which sometimes goes by the name 'dancing bones'. These get modified stems and then yellow flowers kind of emerge from the ends of the stems.